Welp, I am slowly improving…I think. I had diarrhea this morning and felt weak and achy in my back like I had the flu and slightly warm. Many of these symptoms are similar to basic aches and pains of thru hiking, but all combined after throwing up twice in a 24hr period ain’t good. Plus, I’m just not hungry. I’m just weak and it makes this quite difficult. Good news is that it improved by lunch and I actually had a bit of my regular energy on and off the second half of the day today. I’m really tired right now though and again am bummed that I can barely do my chores and blog…. We got going at 6:40am and had some big events today. It had been in the 30s overnight and Katherine was cold, but I was ok. Could be partially due to my body maybe being feverish. We had a couple big cross country climbs up over ridges and it’s getting to be pretty fun. Katherine loves it and has led the way this leg with my low energy as its all I can do to just barely hike. She really has fun trying to figure it out without using a GPS and says she enjoys the mental exercise, but it’s also a good time saver to use the GPS, so I think there’s been a good balance of the two. 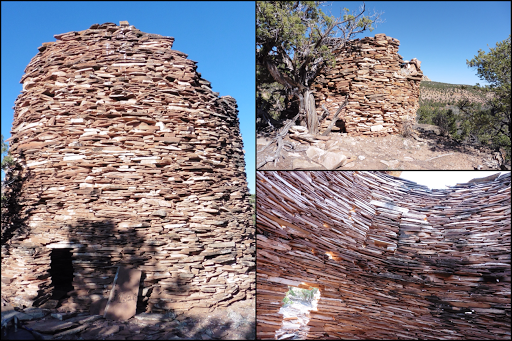 On one of our climbs, we entered Ruin Canyon and twice we got to the top of a ridge to see an old ruin there. They were really amazing to see in places that seemed very remote and difficult to get to. 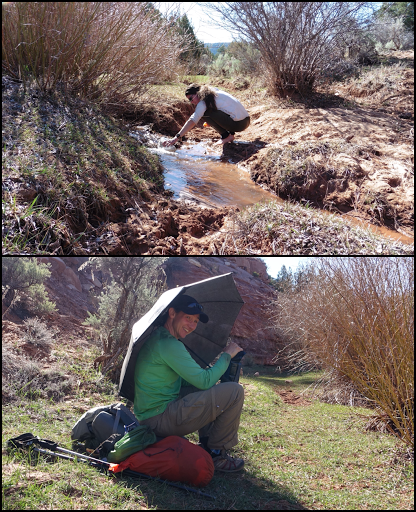 The other challenge of the day was water…we got water halfway through the morning on the way into Ruin Canyon. It wasn’t alkaline, but it was cow infested, yum! Here’s the source and me filtering it under my umbrella. Whatever this stomach thing is, it isn’t giardia. I think it’s just my sensitive stomach adjusting to the alkaline and heat combined with my weaker immune system at my time of the month. Just a bad combo probably. To add to the fun, one of the blotches of heat rash I have (that itches a ton) is on the side of my neck. So I’ve been dodging direct sunlight best I can on that side and the unbrella had been great for that. 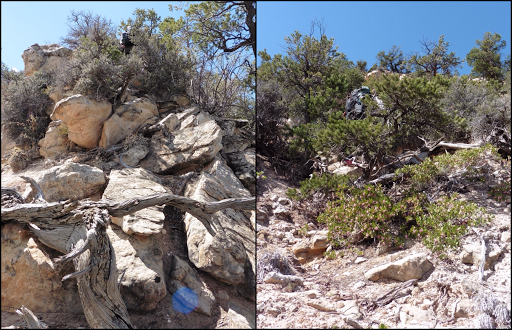 Then we did the other steep climb for the day with lots of scrambling up and through rocks, sand, and brush. Here’s a couple photos of Katherine on the way up. Look closely, she’s there. It took us an hour to go about 1.3mi to give people an idea of the difficulty and pacing. It was the first time I was dripping sweat a bit on this trail. I somehow felt great at lunch and enjoyed eating for the first time in a long time. The rest of the day was spent in Dark Canyon and my energy was up and down. There were many other backpackers along this trail (yes an actual trail!) through Dark Canyon. The temps dropped and it got overcast the last couple of hours and that really helped me. Tomorrow is when it’s supposed to be a bit cooler in the )0s as opposed to the 70s and 80s we’ve been having. Even covered up my heat rash is still going strong. Still waiting for it to run its course, but it’s more widespread than any other time and taking long to clear. 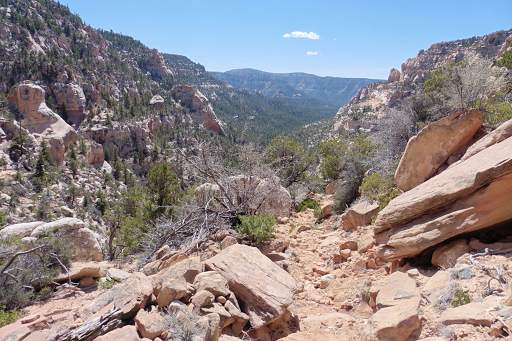 Here’s the views going down to Dark Canyon and once in the wash. 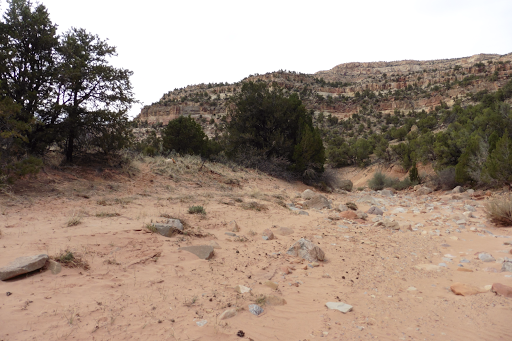 The trail wove back and forth over the wash and there was a lot of short steep ups and downs in sand. 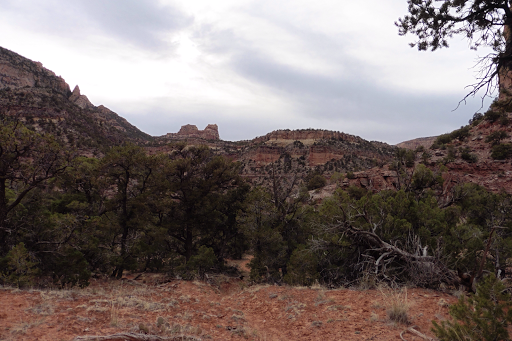 Sometimes I feel like this hike is one big sand dune separted by rocky scrambles. It was tiring and also exacerbated Katherine’s ankle pain that she’s had for awhile before the trail and careful to ease into the trail. There were also NOLS (National Outdoor Leadership School) groups out there. Still yet to go a day without seeIng another person. We were fortunate that the NOLS people were familiar with the area and they told us where we could find water in a pothole up a side canyon. Here it is. 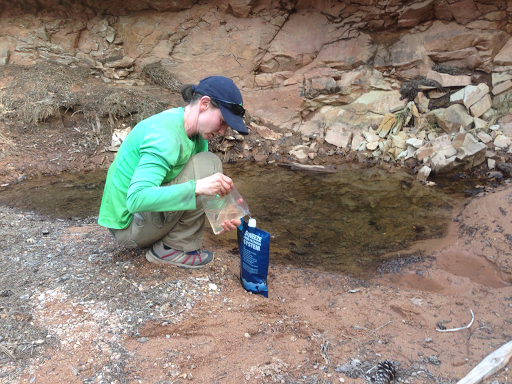 I use a ziploc to scoop it out and into the Sawyer bag or bladder before I filter with the Sawyer Squeeze. The last couple hours were nice with overcast skies. The purple and pink colors of the canyon walls really stood out. Pictures just don’t do it justice. 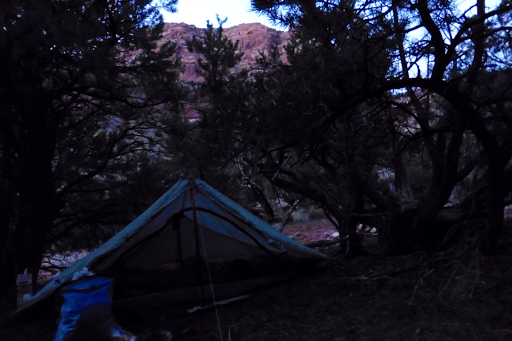 We got to camp around 6:30pm, stopping just short of our hoped endpoint for the first time on this trail, but we were both ready to stop and knew we’d done plenty. Again, I forgot to get a photo before it got darker. I finally felt okay and not completely exhausted and then lots of camp chores took longer than usual, so now I’m up late(10pm) and ready to crash. I still had some digestion issues trying to eat dinner tonight and just hoping it’s on the upswing and running its course. So tired of being tired and looking forward to getting past whatever this stomach thing is! I also have more I’d like to write about than feeling crummy. It has clouded what should be a really great experience and I’m frustrated by that, but I do think it’s on the upswing and my energy will return. I’m carrying half a cooked dinner from the other night I couldn’t completely eat and 1/4 of tonight’s cooked dinner. I also have at least two days extra of food. Just ridiculous to have that extra pack weight. Two more days and I can finally dump it all when we get to Hite!